It's almost Mother's Day! And that means it's time to whip up a special treat for the beautiful women in our lives. This is a quick and fun project that turns out so cute! A relaxing bath is a rare luxury in just about any household, and one that is sure to be savored. Encourage a moment's peace with these sachets of relaxing herbs for the bath; they are affectionately termed Chamomile-Lavender Tub Teas. 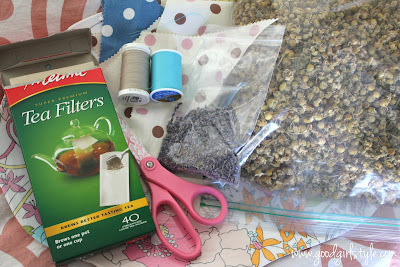 Gather your supplies: Fabric scraps, thread, needle, scissors, parchment tea filters, ribbon, and herbs of your choice. I used chamomile & lavender for a relaxing blend. You could also use mint & lavender, dried lemon peel, dried rose petals, etc. to create your own blend. You should be able to buy these ingredients in the bulk department of a natural foods store. 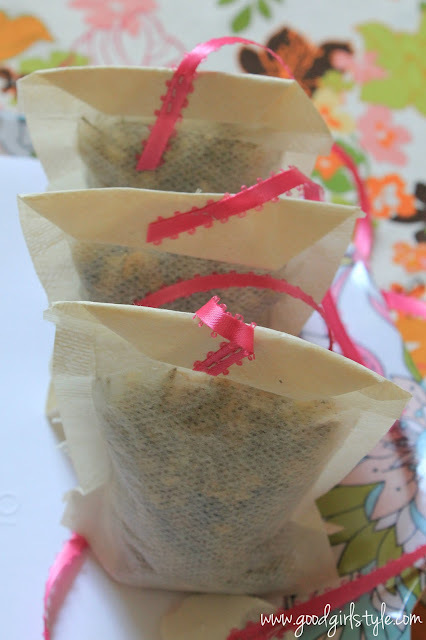 Fill the tea filters with your herb mixture. Then, carefully fold the top down by pulling the two corners in to create a point. Then tuck the point under, and fold once more, like a tea bag top (keep one out for reference, if you need it!). Quickly hand-sew a long length of ribbon (long enough that it can be tied to the faucet of the bath and be in the water) in place at the top of this fold, securing the fold as well. Then, cut out hearts or use your pinking shears to cut little square fabric "tags." I did some of both. I recommend using cloth as opposed to paper, since it might get wet. Sew this tag to the other end of the ribbon. Voila! Time to package them up! 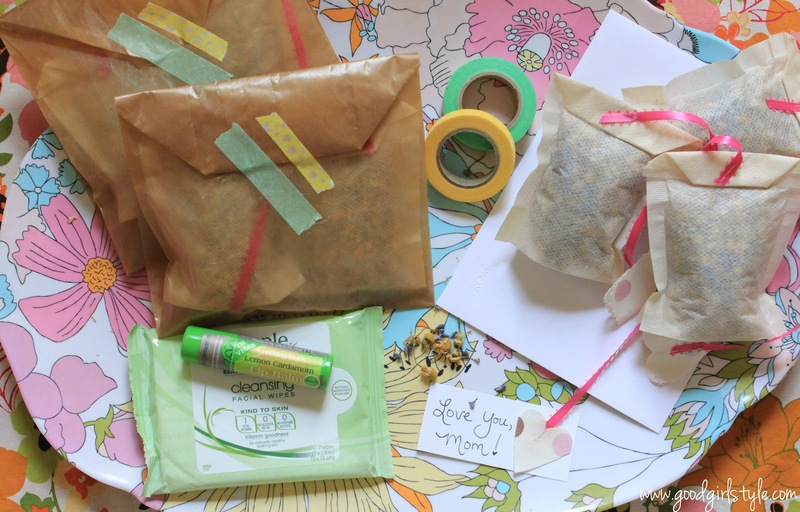 I used my favorite little waxed paper bags and washi tape to recreate another 'tea bag' feel for the outer packaging. You could also make a tea-themed gift, with tea to drink, a cute tea infuser, and a good book. Why not throw in a Dayspring mug, too? I love Dayspring's cheerful, encouraging mugs, and they are only $10! Make sure to include a note for mom that these teabags are to infuse a lovely, luxurious bath soak. Call your mom, pop a letter in the mail (now so you don't forget! 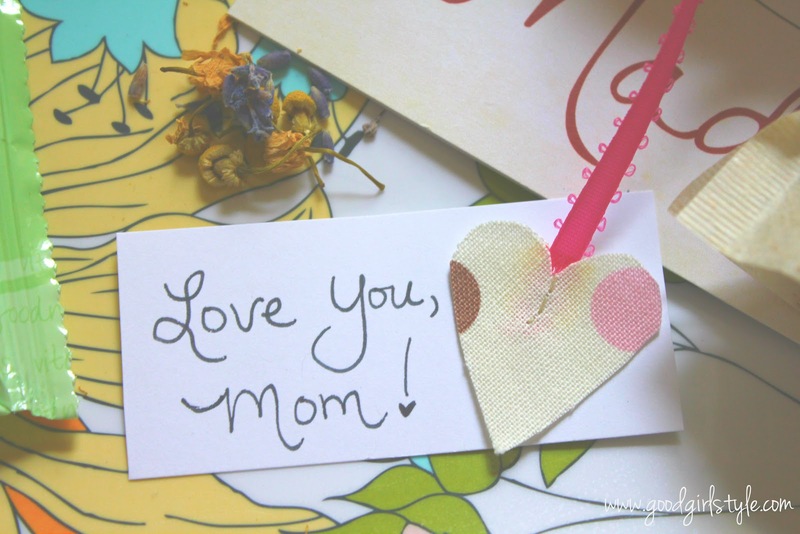 ), or craft up a cute little weeknight project to lavish the love on moms! They deserve it.